Station Hollywood: Happy birthday to Bappi Lahiri. Happy birthday to Bappi Lahiri. The viewers of bollywood films wish happy birthday to Bappi Lahiri on 25th November, 2017. He had huge contribution in bollywood music during the 70s and 80s and his compositions are remembered even today. He is the son of famous Bengali singer and composer Aparesh Lahiri. Aparesh Lahiri had very impressive basic discs and the songs like “takka tare”, “jhar” stormed the Bengali audience in the 50s. His composition for Lata Mangeshkar, titled “ekbar bidae de ma” in Bengali films should his capability of using powerful resources successfully. Bappi Lahiri emerged in the bollywood film arena, when composers like Shankar Jaikishan, Roshan, Madan Mohan, SD Burman, died and composers like Laxmikant Pyarellal, RD Burman, Kalyanji Anandji were the main competitors in the late 70s. Bappi created an impression before the audience with his compositions for the film Zakhmee where Sunil Dutt and Asha Parekh were the main performers. The music of his film Namakhalal became super hit. Big B’s lips and Kishore Kumar’s song “ki pag ghungru”, made Bappi Lahiri a big star in the early 80s. He also gave ppular music in the film Sharabi, where again the Big B, KK combination stormed bollywood. The song “imtehan ho gayi intezr ki” became super hit. Bappi Lahiri and KK combination did work also in the films of Mithun Chakravarthy. All the songs of the film Disco Dancer became super hit where Bappi Lahiri himself sang hit songs like “yaad aa rahai”, etc. The other hit films where Bappi Lahiri contributed well include Thanedaar, with Sanjay Dutt and Madhuri Dixit, where the song “tama tama loge” became very popular. Bappi Lahiri was very successful in his composition of music for Bengali films as well. His music in Uttam Kumar’s last film Ogo Bodhu Sundari became super hit. KK’s songs “ami ekjon santoshito”, “shikte tomai hobe”, etc., became very successful. The other hit Bengali films where Bappi Lahiri made valuable contribution include Guru Dakhina and Amar Sangi. The hit songs include “o amar gurudakhina”, “prithibi hariye geche”, “sangi, sangi”, “jekhanei thako”, etc. He sang the song “u lala u lala” in the film Dirty Picture. The film had reciprocated the great music trend of 1980s when Bappi himself composed music in films like Himmatwala. Bappi Lahiri had been often criticized for copying music from international films and other sources, as his tunes were very similar to others tunes. But that controversy is faced by lot of modern composers as well. 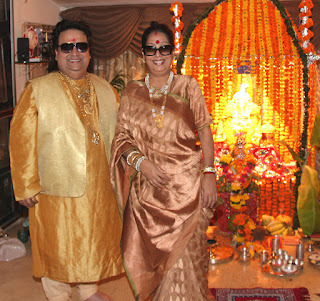 The big thing is Bappi Lahiri had entertained audience of bollywood films for more than 15 years. His admirers expect him to compose innovative tunes in more films in future.